2 people severely injured after a tourist bus carrying 31 tourists crashed into a truck on Hainan East Line Highway on Wednesday afternoon, reports hinews.cn. The rear-end collision occurred when the bus from the city of Sanya, bound for Haikou in Hainan province, crashed into a truck on the Hainan East Line Highway, 60km away from Sanya. The 31 passengers on the bus escaped from the bus after they broke the windows. 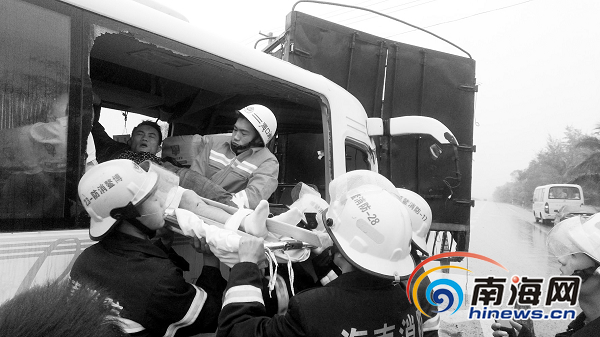 However, the bus driver and tour guide were trapped in the bus and were injured in the legs. Rescue efforts completed after 27 minutes and the injured were rushed to a local hospital. Passengers praised the tour guide who guided them to break the windows with emergency hammers and called the travel agency to deal with the matter. An investigation into the cause of the accident is underway.